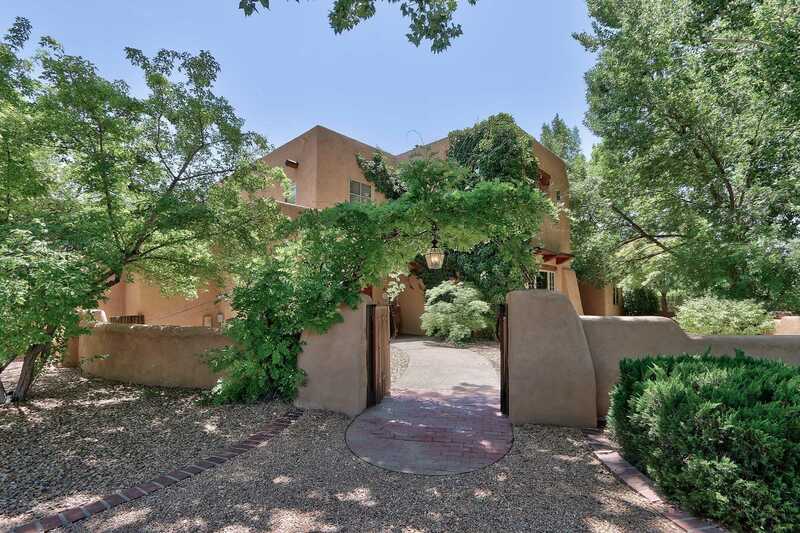 MLS# 937297 - 8206 Rio Grande Boulevard Nw, Los Ranchos, NM 87114 - The FIRM Real Estate Group Inc. Incredible restored estate at the end of the lane under tall cottonwoods. Gated and completely fenced for privacy, previously a haven for stars, directors and writers, this California style pueblo with its recent beach style pool and spa creates a private residence with park-like grounds. Renovated spaces with brick and tile floors,recent refrigeration units,two masters, one with separate access, an exercise barn, 4 fireplaces, an outdoor kitchen/gazebo and extensive patios were created for large-scale entertaining. Perfect for your own luxury lifestyle. This property may be viewed through the month of February so don’t wait to call for a private showing.